Lovell's Island, three-quarters of a mile long and one-third of a mile wide, is about seven miles from Boston and about one-and-a-half miles from Boston Light. The island's proximity to the main shipping channel into Boston has dictated its uses through the last three centuries. It was briefly employed as a quarantine station in the 1600s, and in the early twentieth century the island became home to Fort Standish. In the 1700s, a large tree on the island served as a day beacon for mariners entering Boston Harbor. A buoy depot was relocated to the island from Cohasset, on Boston's South Shore, in 1875. In the early 1900s, the opening of the Broad Sound Channel, which connected with the old President Roads channel, necessitated a new system of navigational aids to direct traffic to the inner harbor. A sum of $10,000 was appropriated for the Lovell's Island Range Light Station on June 28, 1902. The station was built in 1902-03. Two light towers were erected on the northern part of the island, known as Ram's Head. The conical, shingled wooden towers were 40 feet (the rear light) and 31 feet (the front light) tall, and 400 feet separated the two. A seven-foot high wooden walkway connected the lighthouses, the six-room keeper's house, a woodshed, and a small brick oil house. The station went into service on April 10, 1903. Right: The children of George Kezer, who was in charge of the buoy depot at Lovell's Island for several years prior to 1921. Left to right: Walter Burgess Kezer, Albert Lewis Kezer, Estelle H. Kezer, Eldon Lester Kezer, and Thatcher Warren Kezer (born when his father was an assistant keeper at Thacher Island). Courtesy of Barbara Kezer. Both towers held fourth-order Fresnel lenses. The rear light exhibited a red flash every five seconds, and the front light's characteristic was fixed red. Mariners heading toward Boston from Broad Sound Channel, or from Hypocrite Channel farther to the east, lined up the rear light directly above the front light, thus assured they were in the center of the main shipping channel. 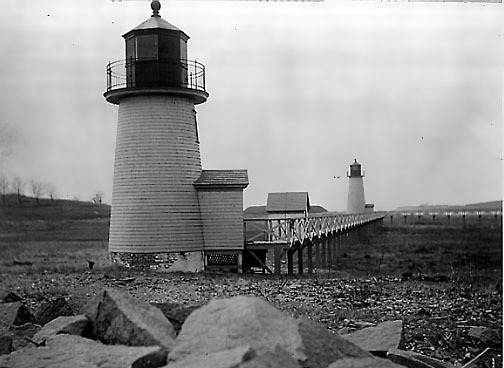 The first keeper of the two wooden lighthouses was Alfred G. Eisener of Bremen, Maine. Eisener had been an assistant keeper at Thacher Island and keeper at Cuttyhunk and Plymouth. Left: Alfred G. Eisener and his wife, c. 1911. From the collection of Edward Rowe Snow, courtesy of Dorothy Bicknell. In his spare time, Eisener wrote poetry as well as accounts of his experiences. With what he has in store. A Boston newspaper reported in 1911 that "the house faces the water of the main ship channel, and Mrs. Eisener keeps it as presentable as the lenses of the revolving light." Succeeding Eisener as keeper in 1919 was Charles Jennings, a native of Provincetown, Massachusetts, who had previously served at Thacher Island, Monomoy Point, and Boston Light. We know a great deal about the Jennings family's years at Lovell's Island, thanks to a delightful 1989 volume published by his son, Harold, called A Lighthouse Family. Harold recalled that the family had a large garden near the keeper's house, along with chickens, ducks, and turkeys. The turkeys were a variety called "bourbon reds," bought through the poultry section of the Sears and Roebuck catalog. Right: Keeper Charles Jennings at the base of the rear range tower. Harold had fond memories of Christmas on Lovell's Island. The family would cut down a pine tree on the island and decorate it on Christmas Eve. Keeper Jennings gave his son handmade toys, and years later Harold still had a hand-fashioned lighthouse and a battleship. "He made me a barge one year," Harold recalled, "which had thread spools for drums to coil ropes and the derricks went up and down -- a joy." While digging in his garden, Keeper Jennings would occasionally find an old, tarnished coin. The oldest of these European coins dated to 1600. Historian Edward Rowe Snow speculated that the keeper had accidentally inadvertently unearthed some of the treasure from the Magnifique, a 74-gun French man-of-war wrecked on the island in 1782. During a severe storm in March 1931, the lighthouse station was under six feet of water. Keeper Jennings had to row a dory to the towers to keep them lighted. Left: Harold Jennings (1921 - 1996). Courtesy of Mrs. Harriet Jennings. In this clip, circa 1989, Harold Jennings explains why he didn't swim at Lovells Island. In this clip, circa 1989, Harold Jennings remembers the underground tunnels on Lovells Island. Harold Jennings learned to be a "wickie" from his father, who taught him all the secrets of keeping the kerosene lamps burning cleanly through the night. This training paid off when Harold was 18. Charles Jennings fell ill in April 1939. His wife performed the keeper's duties for a while, but Harold quit high school and became the last keeper of the Lovell's Island Range Lights. Right: Keeper Charles Jennings and historian Edward Rowe Snow, January 1, 1937. From the collection of Edward Rowe Snow, courtesy of Dorothy Bicknell. For years, the Lovell's Island Range Lights shared the island with the Army's Fort Standish. In the late 1930s, the government decided to expand the fort, and the light station was discontinued to make room. The towers were torn down in 1939; all that remains today is the station's oil shed. The island is accessible by water taxi from George's Island and by ferry from Hingham and Hull in the summer. The lighthouses may be gone, but the island is a pleasant place to spend a summer day. This page is dedicated to the memory of John Forbes and Harold Jennings.